It's a great pleasure to be here at the second "Philanthropy for Better Cities Forum", and to address a distinguished audience like you who come from all over the world, from many professions, interests and backgrounds, but all with a passion for building better cities at the human level, creating a future in which everyone has the opportunity to flourish. My Government is committed to seeing Hong Kong rise as a caring, compassionate and inclusive society, and we are working, with determination and innovation, to realise that goal. I often quoted the following two facts, which really speak for themselves. The first is that some 60 per cent of our recurrent government budget is spent on education, social welfare and medical services. The second is that our spending on social welfare has surged by over 86 per cent in the past six years, with a range of initiatives on social security pioneered by the Commission on Poverty, which I chaired during my time as the Chief Secretary for Administration. Despite the above, I can assure you that we will not hesitate to put in more resources as necessary to meet the complex challenges that pervade our community. Thankfully, the Government is not working alone. 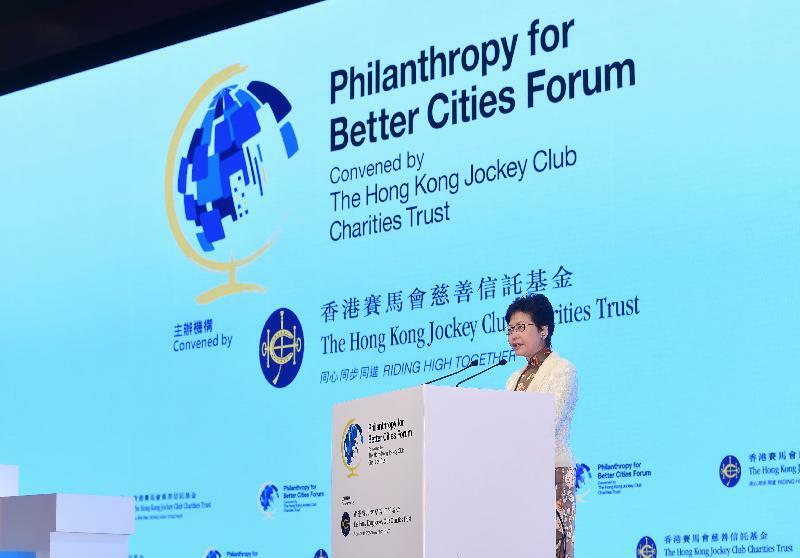 Philanthropy has a long and proud history in Hong Kong. The first Chinese hospital in Hong Kong was built by a group of civic-minded local leaders through community fundraising. The University of Hong Kong was founded in 1911 thanks largely to the generosity of an Indian-born philanthropist. Two of the oldest charitable organisations in Hong Kong, the Tung Wah Group of Hospitals and Po Leung Kuk, date all the way back to the 1870s. 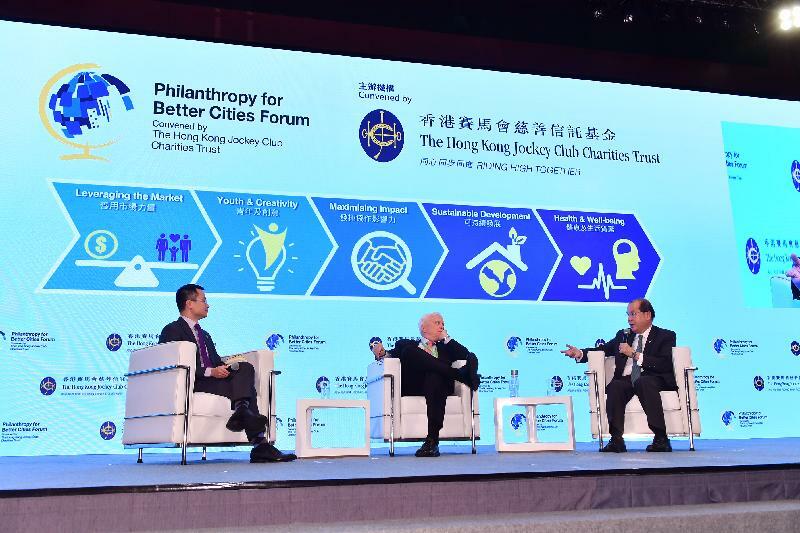 And through its Charities Trust, the Hong Kong Jockey Club, this Forum's organiser, is among the world's leading charities, with annual donations in recent years reaching over HK$4 billion. We have gained international recognition on this front. In last year's "World Giving Index", published by the UK-based Charities Aid Foundation, Hong Kong ranked 25th out of 139 countries and regions. And in the inaugural "Global Philanthropy Report", published earlier this year by the Harvard Kennedy School, Hong Kong finished fifth among 39 countries and cities, based on philanthropic assets as a proportion of GDP. 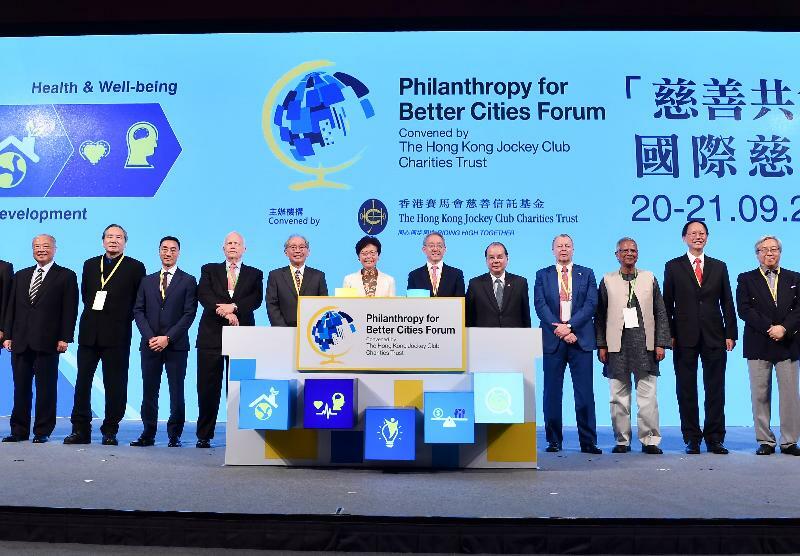 We are also seeing more and more Hong Kong families establish philanthropic foundations, making significant donations to a variety of worthy causes. Indeed, the number of charitable institutions and trusts registered for tax exemption purposes doubled from 4,400 in 2006 to more than 8,800 in 2016. It is an encouraging trend, but given the multitude of social issues that daily confront us, from poverty and rapid aging to the social exclusion that disadvantaged groups within our society can face, we must be innovative. We need to find ways to expand our sources of assistance and collaborate with more sectors of our community. It's why we created the Social Innovation and Entrepreneurship Development Fund (SIE Fund) five years ago. The Fund was designed to support social entrepreneurs, those focused on developing innovative and successful products and services for society's needs. Over the past three years, the SIE Fund has put more than HK$120 million into 140 projects, and I am pleased to say that it's finding success. Consider, for example, the Yeh Family Philanthropy (YFP) fund. The YFP, working with the SIE Fund, runs an educational programme on social entrepreneurship and venture philanthropy at two Hong Kong universities, and has added a third local university this academic year. To date, the universities have made available nine credit-bearing courses, inspiring more than 200 students. They work with social ventures to tackle real-life social and business problems and, in doing so, benefit our underprivileged and the needy. Then there's the Community Housing Movement, launched one year ago this month by the Hong Kong Council of Social Service. With funding from the SIE Fund and Community Chest, the Movement offers an intermediary platform in soliciting and renovating idle residential properties from private developers, and then let them to families in need of transitional housing through eligible NGOs. The Movement hopes to offer, over the next three years, 500 housing units benefiting 1,000 households. Philanthropy is a major source of matching funds for SIE-sponsored social ventures. To date, about 40 per cent of such social ventures are funded with support from a dozen philanthropic foundations. The SIE Fund is also introducing new funding options through equity investment and "pay-for-success". The latter, sometimes called a "social impact bond", is gaining interest worldwide. A public-private partnership, it funds public services through performance-based contracts, enabling governments to partner with high-performing service providers using private investment. Public-philanthropy partnerships can enhance expertise, boosting the likelihood of a social venture's success. For example, the Lee Hysan Foundation, a family institution, is providing advice in the operation of Food-Co, a collaborative effort created to reduce food waste. Food-Co works to get otherwise wasted food to the needy through a network of Hong Kong service operators, corporate food donors and volunteers. Given the prominent role of philanthropy in driving social innovation, four members from our philanthropic community were added to the SIE Fund Task Force just two months ago. It's a first, but it may be the first of many such collaborations. In short, our efforts in building a caring and inclusive society are evolving, our collaborations expanding and the results encouraging. What we need now is to take our efforts to an entirely new level or in another dimension. I'm talking about the concerted and comprehensive involvement of business, at every level in every industry and sector. I'm talking about embracing the "creating shared value" mindset – truly a transcendent vision – introduced by Harvard Business School Professor Michael Porter who spoke at the 2016 Forum here. In a city or a community meaningfully supported by shared value, business creates economic benefit both for companies and society. They do so by focusing on the needs of societies no less than the needs of their shareholders. Business here in Hong Kong is increasingly aware of this opportunity. Indeed, in the past our companies have been making sizable donations. I am grateful for their generosity but this is not enough. What we need is more than an "add on" to business management and annual expenses. What Hong Kong needs, or what the world and its people need, is the systematic incorporation of creating shared value to the strategy, the mission statement, and the bottom line of every business. It may sound idealistic, but through such forums as today's, through such resolute commitment and innovation as you bring to this day, I am hopeful that we will sooner than later make it happen. Finally, my thanks to the Hong Kong Jockey Club Charities Trust for organising this meaningful and successful conference. I wish you all a rewarding two days, and better cities in all our futures. Thank you very much.